In February, stocks took the most dramatic tumble in years after surging to unprecedented heights. The bull market continues to age. It has been almost ten years since the start of the current bull market, which is the second longest in modern history. Many people are now questioning whether the recent plunge in prices is foreshadowing the next bear market. I too believe that we are near the next bear market, but I also believe that we may have at least one strong rally left. The economy is now starting to receive a nice boost of inflation recently, which stocks and other assets (e.g. commodities) have historically liked in modest amounts. A bump in inflation usually means wages are increasing and the economy is growing. However, the rise in inflation will become so great that interest rates will rise to a level that puts too much stress on businesses and consumers. This stress will eventually send the economy and markets into a tailspin. But not yet. Graham Summers of Phoenix Capital Research agrees with this assessment as well. He sees inflation boosting stock market prices to all-time highs over the next 6 to 9 months. I’m not as confident about reaching all-time highs, but I am confident that we could begin a strong rally soon. 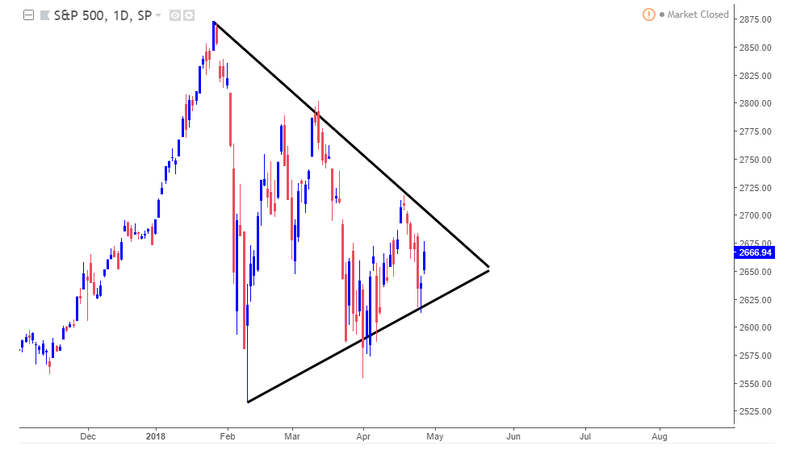 We are also seeing the price of the S&P 500 become compressed within a triangle pattern. This typically means that price is getting ready to make a large move. At this moment, we are not certain whether that move will be up or down, but of course I believe the move will be up. Once the price breaks the pattern (up or down), wait for it to retest and find support (or resistance) on the pattern to confirm the move. Persisting economic strength is another reason I believe we are in store for another rally. Although it appears that we are most likely near the end of the economic cycle, some metrics are still looking good. For example, the Initial Jobless Claims number is now at its lowest since 1969. The yield curve also appears to still be in a downtrend. A recession does not usually occur until the yield curve bottoms and reverses upward. The yield curve also usually dips below zero before a recession. However, in this article I describe why that will probably not be the case this time around. In any case, we are still several months away from a recession. Due to the large drop in prices in February, retail investors’ bullish sentiment has collapsed. This can often be viewed as a contrarian indicator. In other words, this often means that prices are ready for a rebound. I expect investor sentiment to go higher until the recession makes it collapse a lot lower than it is right now. Although markets are in a very volatile and unpredictable place, I am betting on a strong rally. A break below key support levels (e.g. 200-day moving average, triangle pattern, etc.) would make me change my mind. Furthermore, we must be aware that risks are high and a recession is near. Before making any changes to your investment portfolio, you should do a ton of research. Consider consulting a financial professional as well. Good luck and happing trading.